Well guys, here it is, the result of my weekend therapy session - Tie One On March/April. The theme was rick rack. I had intended to use more, but after assembling the apron, I think the jumbo rick rack at the bottom was enough. I think it's cute. A little busy, but cute. My original inspiration for it was the spring 2007 Hanna Anderson catalog. I love those pastel dresses with the combo of fabrics! Of course, my fabric choice and style are nothing like the H. A. catalog, but that's where the idea came from. 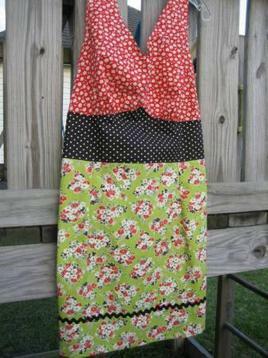 To make my apron, I used KwikSew 3066 for the upper bodice, if that's what you call the top of an apron. 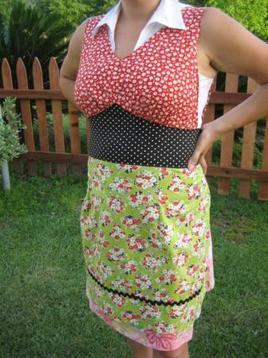 I've used this pattern to make a top in the past, so I knew that it would accommodate the "girls". 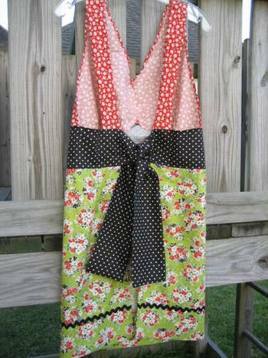 I wanted this to be a halter style apron, but after sewing it together, I realized that wouldn't work. The neckline was all wonky, it wouldn't work at all. Luckily, my ties were just long enough to go to the bottom of the sash, so I went with it. I think I like this style better. Halter ties tend to bug me. This was a fun project. I'm usually a planner, so it was fun to wing it. Other than the pattern piece for the bodice, the rest was trial and error, which is why my sash ties aren't long enough and the halter ties didn't work out. I may have stayed up until 1am to finish it, but it was worth it! Who needs sleep when you've got a fun sewing project to finish? ?